Happy birthday to one of my favorite writers, the late, great Dashiell Hammett, who was born on this date in 1894. "Hammett gave murder back to the kind of people that commit it for reasons, not just to provide a corpse; and with the means at hand, not hand-wrought dueling pistols, curare and tropical fish," wrote Raymond Chandler, another late, great crime writer, and another one of my favorite writers. "He put these people down on paper as they were, and he made them talk and think in the language they customarily used for these purposes. He wrote scenes that seemed never to have been written before." I've been reading and rereading Hammett's crime novels and short stories since I was a teenager. Despite his foolish admiration of the communist dictator and mass murderer Stalin and his naive attachment to the American Communist Party, I've come to admire him as a man and writer. One has to admit he had the courage of his convictions, and he served honorably in the U.S. Army in both world wars. But it was his time as a Pinkerton detective that provided Hammett with the material for an original body of work that draws each new generation of crime fiction aficionados to him. I've read a couple of biographies of Hammett over the years and a short while back I read Nathan Ward's excellent book on Hammett, The Lost Detective: Becoming Dashiell Hammett. I enjoyed the book and I liked his idea of covering his life before his fame as a writer, before his relationship to writer Lillian Hellman (an awful person, in my view), before his six-months in prison, and before his IRS difficulties and testimony before the McCarthy hearings on American communists. Ward's book informs us that Hammett left school at 14 and joined the Pinkerton Detective Agency as an operative in 1915. He left in 1918 to serve in the U.S. Army during WWI, where he contacted tuberculosis, and he returned to the Pinkertons the following year and stayed as a detective until 1922. "A good detective has to be brave, vigorous, damnably clever, tireless - altogether a real person! His is an extraordinarily complicated mechanism" - Dashiell Hammett. As Ward notes in his book, his tuberculosis forced him to give up being a detective, but it may well have prompted him to become a literary legend. The journey on that hard road is what Ward's The Lost Detective is all about. "While Hammett's life on center stage has been well-documented, the question of how he got there has not," Bloomsbury, Ward's publisher, writes. 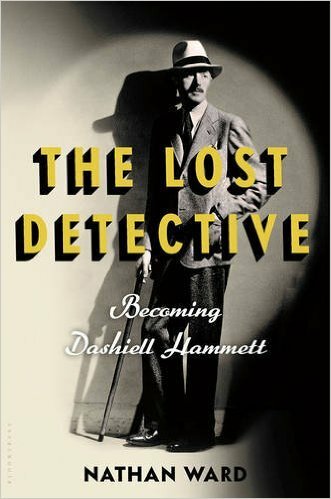 "That largely overlooked phase is the subject of Nathan Ward's The Lost Detective: Becoming Dashiell Hammett. Hammett's childhood, his life in San Francisco, and especially his experience as a detective deeply informed his writing and his characters, from the nameless Continental Op, hero of his stories and early novels, to Sam Spade and Nick Charles. The success of his many stories in the pulp magazine Black Mask following his departure from the Pinketons led him to novels; he would write five between 1929 and 1934, two of them, The Maltese Falcon and The Thin Man, are now American classics." Ward researched the Pinkerton archive at the Library of Congress, which holds sixty thousand documents and several hundred boxes of operative reports, along with agency employee records and other papers. Unfortunately, Ward was unable to discover any of Hammett's reports. "But even after an hour spent reading through the reports of other operatives gives a good idea of the experiences and format that formed Hammett as a writer," Ward writes in his book. "I decided to become a writer. It was a good idea. Having had no experience whatever in writing, except letters and reports, I wasn't handicapped by exaggerated notions of the difficulties ahead" - Dashiell Hammett. If you've read and enjoyed Hammett's stories over the years, as I have, you might enjoy reading Ward's insightful and informative book.